where mold began to grow. wood frame threatening to end its life. at my sister Ellen's school, The Newton Country Day School. 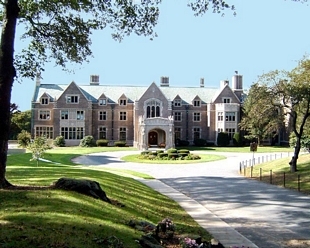 This school is a Catholic girls school located near Boston College. When I posted this pic it brought to mind my blog friend Tina's house!! Anyway, my parents bid on the chair and took it home where we had it for many years. One can only wonder where this old money looking chair had lived before it came home with them~and after several decades, they gave the chair to my sister, who at some point put it in storage in a basement. Last week I got an email from her with a list of things she was getting rid of~and this chair was one of them. I told her I would love to have it. When I picked it up, we saw it was covered in white patches~argh! What to do...so I did a little homework on the subject and am very pleased with the results. you remove the mold it is not disbursed through your living space. I did not take any before pics as I was busy with the task at hand. Get a stiff brush, I used a horse grooming brush that we use on our big dog. Give the upholstery a vigorous brushing. The mold spores went flying off into the air with each brush stroke. Brush the entire chair, and underneath where the cambric is (the black piece of fabric that covers upholstered guts). wood surfaces and the nail head trim. any mold that was left lurking on the surfaces. I sprayed the fabric and the wood heavily. I'll tack the trim back on when I take it inside. The chair came out fantastic! No smell or hint of mold~I added it to the fireside. in the pattern which is in my basic color palette. Do you have a piece of history to save? I made these large pillows for the sofa for a winter look. I used a french script fabric by Braemore and a roll of Michaels burlap ribbon. I used large pillows I had and cut the fabric to size. these pillows will cost less than $20 for the pair. of the pillow with about 6 inches extra. down the middle of the burlap ribbon so it catches the raw edge of the fabric. This is going to give your pillow edge a flange effect. folding it at an angle (google this if you don't get it!). Stop a few inches after you get around your last corner. Insert the pillow~then continue stitching, and enclose the pillow. and finish stitching. All done! than 45 minutes to make these pillows. with text on it if you wanted to embellish it to get a more rustic look. 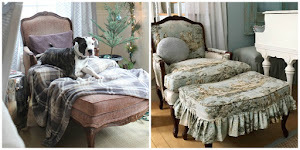 Very pretty~a rustic romantic look for my winter sofa. my rustic and romantic and rugged guy. All comfy and cozy. You just gotta smile. 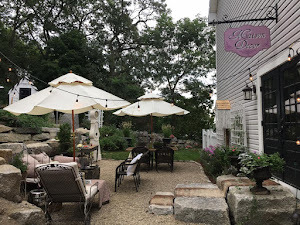 A cozy dining room in a Cape Cod style home outside of Boston gets a nice update thanks to some Pottery Barn sheer linen striped panels and a new lantern. The sheers are waiting to be hung, but before I do, I wanted to make sure you can all see how much of a difference it makes to hang your curtains as high as possible~and to update your curtain style and add some panache with a great light fixture. The client's room before photo showing off the outdated swag and jabots and the standard 5 arm brass chandelier hung over the dining room table. 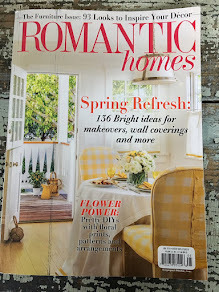 She and I discussed ready made drapery options, but what I really wanted to update as much as the window treatments was her light fixture. A lantern brings both a traditional New England vibe mixed with a bit of contemporary elegance, perfect for this young couple. That is what spurred me to write a recent blog post on using a lantern in favor over a chandelier~and so after reviewing it, she selected this bronze lantern from Overstock.com. You can read more about lanterns here. Everyone loves a good before and after, and I understand why. It shows dramatically how small changes can make huge differences. The long sheer panels make the ceilings feel taller and the mood more elegant without being stuffy. 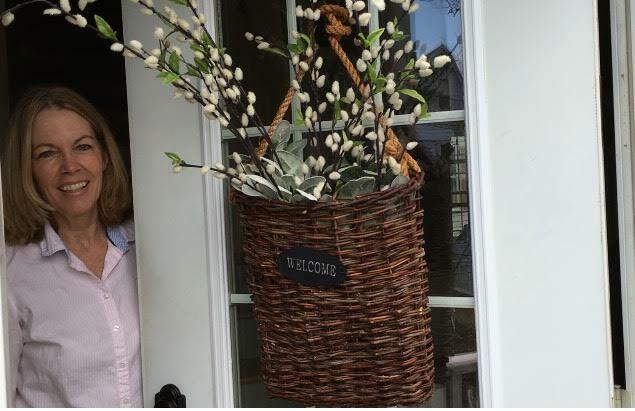 The Lowes curtain hardware was selected to relate to the lantern. A curtain closeup~ hard to detect, but these are striped in cream and taupe, and almost 100% linen. all that was missing was a chilled Sauvignon blanc! a resident of the house, made sure I got it just right! sitting patiently waiting for her reward!! you'll enjoy those rooms so much more! "Opaline Glass is a decorative style of glass made in France from 1800 to the 1890s, peaking in popularity during the reign of Napoleon III in the 1850s and 1860s. The glass is opaque or slightly translucent, and can appear either white or brightly colored in shades of green, blue, pink, black, lavender and yellow. The glass has a high lead content which defined it as semi-crystal." 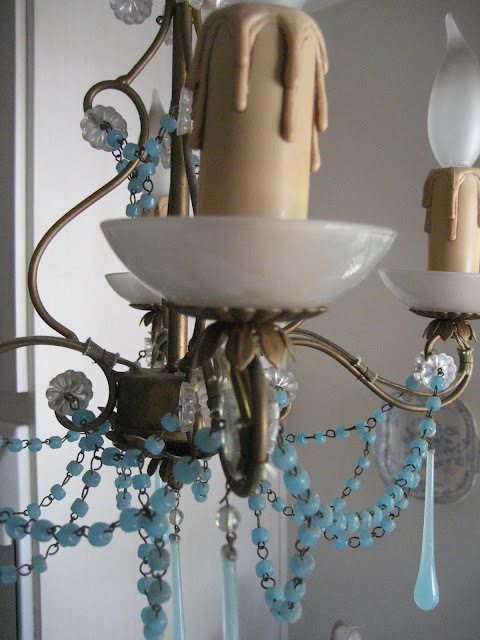 I will be on the lookout for all the colors of Opaline, but for now I have some pretty Opaline glass chandeliers in blue to share. This is my new OLD chandelier! I was told it was purchased in Austria a long time ago...look how pretty the color is, very aquamarine! After I posted on this chandlelier I got an email from Cheryl, who writes the Fresh Vanilla for C blog. 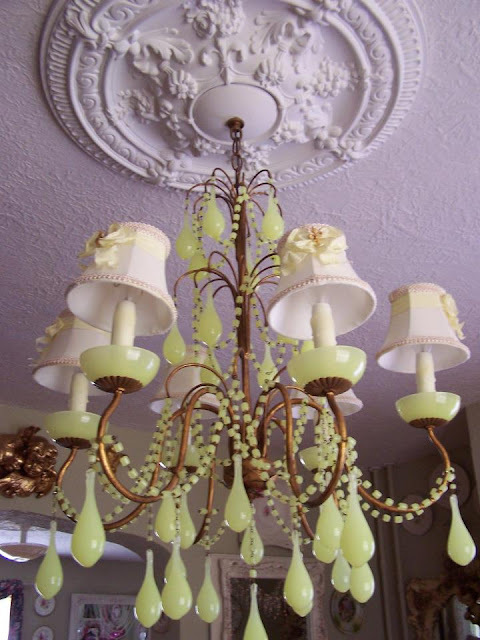 She has one with the same kind of glass and she wanted to know where she could get more glass drops to add to her chandelier. Cheryl wants more drops, but the problem is that they don't make them anymore! 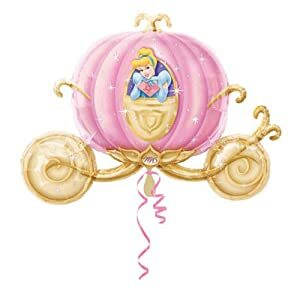 You have to hunt around on eBay, and hope to get lucky, or hope you have a fairy chandy godmother like I had (!! ), but that part of the story is further down. I bought some from eBay myself, and they were a complete knockoff, with a glass that is dark and dull and flat. But Cheryl's pretty chandelier has a few of those star flower crystals called "rosettes". I read somewhere that only the French chandeliers have those! 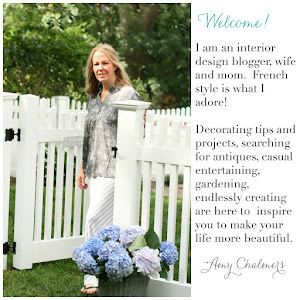 She hangs her chandy in her kitchen and hasn't even blogged about it yet!! 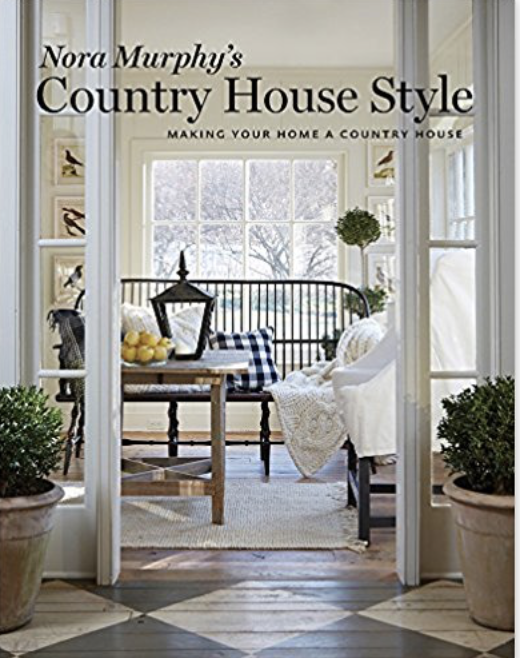 So it is making its debut over here at Maison Decor. I just love the draped beaded garland on these chandeliers! "AREN'T YOU JEALOUS???!!! It was the first thing I bought for my new home, and it set the color scheme for the living room and dining room. I got it from a store in North Cambridge, MA called City Lights, it's on Massachusetts Avenue, if you want to go check it out. (The store, not the chandelier. It's an antique, so I got it, and you can't have it.)" Check out the close up. Check out the tear drop blue crystals. Check out how coooollll this is. The little blue beads are called barrel beads. CHECK THEM OUT!!! I love it! I love it! I love it! I love it! I love it!!!!!!!!!!!!!!! The reason they are called barrel beads is because.....(wait for it) They are shaped like a BARREL!!! OK, back to Wikepedia~ "The primary influences on this style of glass were 16th century Venetian milk glass, and English white glass produced in 18th century Bristol." Now this is interesting, and should be to Betsy because she also collects Bristol glass, which is another subject for another day. Maybe she can write about it on her blog so I don't have to. This blurry Betsy pic shows her custom made shades she put on her chandy. She likes to spend lots of money on her things! Hubs and I got it all unwrapped, and despite two arms being bent and one glass drop broken and one crack in a bobeche, I couldn't have been more pleased with these pretty old light fixtures. I have little barrel beads too! Some call them macaroni beads~and they string gracefully across the metal frame that looks like it had been finished in a rusty gold color. My beads are connected to little holes in the framework and sometimes they are wired directly to the frame with the thinnest of wire. I noticed Betsy's beads are wired onto the frame too and then the cascade down to a center point and it is hard to see, but it looks like they all join and get pulled back up a bit creating a rounded apple shaped bottom effect puncuated with one long opalescent tear drop. 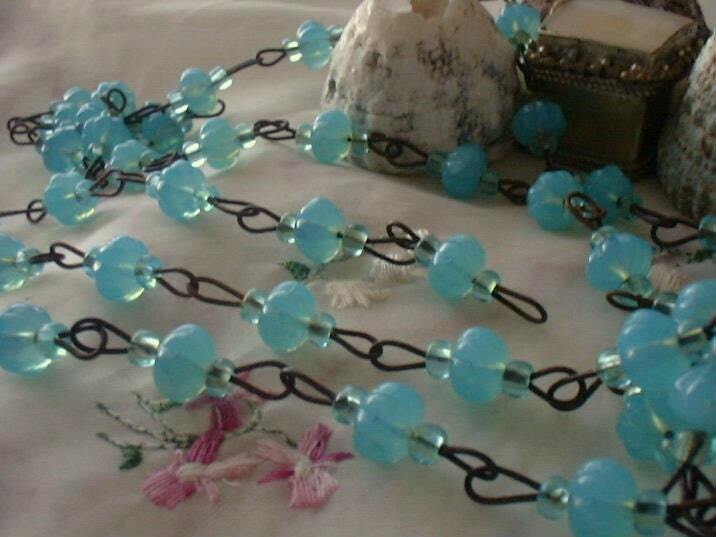 Hers has clear and blue beaded alternating garlands. The frame of my chandelier reminds me of Cinderella's pumpkin coach! Look at these pink opalescent drops on this beaded chandy for sale in an Etsy shop with a price tag of $800+. They don't look like they have the translucent quality in the drops and I wonder if the pink was added~perhaps this is a reproduction, which is fine. But I like old chandeliers so I look closely at the drops to view the wiring and these have tiny holes with thin wire running through it where it is to be attached to the chandelier frame. Mine has a brass pin that is inserted into the center of the glass drop that appears to be set when the glass is hardening. Look at the pink drops below~the wire is coming out of the inside of the glass drop. 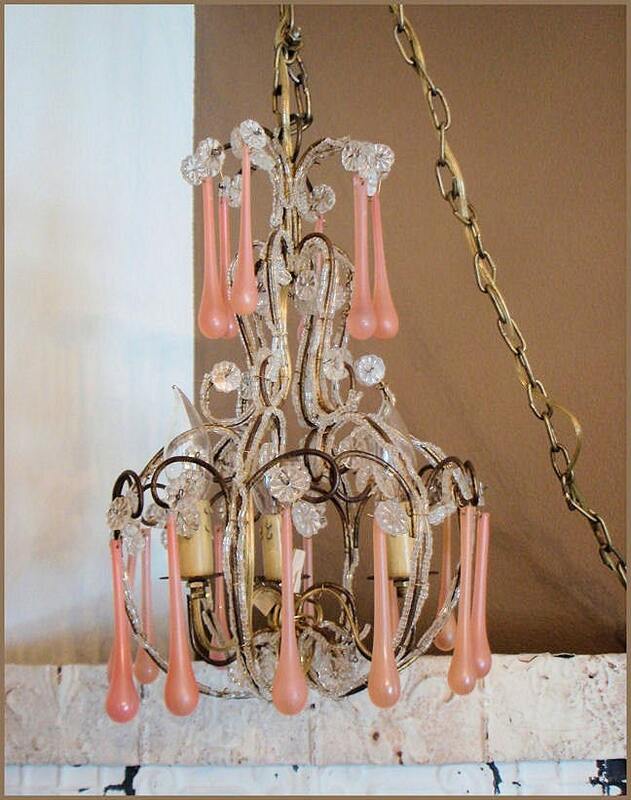 This 1920 French antique is listed on eBay and has milky pink opalescent drops that look to be antique and has a tag of $1499. They aren't giving them away, that's for sure! Even reproduction glass prisms can be made with the wire coming right out of the center of the glass drop~so you have to do a lot of checking if you are looking to purchase only vintage or antique. 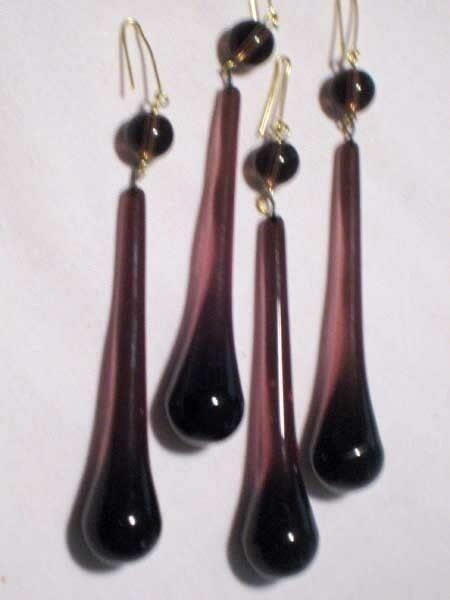 These purple glass drops are in an etsy shop now, and I have seen vintage ones for sale at etsy as well. Hunt around on ebay or just google what you are looking for and see what comes up in your search. These opaline parts were sent to me by a blog reader of mine, Betsy Duggan, as a gift! uh-huh! Super nice, right? I took this picture, and it shows the closeup of the way the wires are connected through the beads and the drops. I climbed up my ladder and using needle nose pliers I replaced clear crystal prisms with the opaline drops and beads. See the tip of the tear drop, you can see the darkened tip where the wire comes out the end. I think these things give clues on the age of chandeliers. The living room chandy was a standard brass vintage thing I bought on Etsy for $40 and then I added different crystals and finally got the coveted blue opaline and added those. So you can build your own chandy to your own tastes by buying old or new crytals, with lots of sources online. This seller on Etsy sells chandelier garland with aged chain to capture the vintage look. This is what she is calling Opaline Czech glass beads and she sells it by the foot for less than $10. She also sells the barrel beads, which she calls macaroni beads, and she had some in white milky glass which was very pretty. 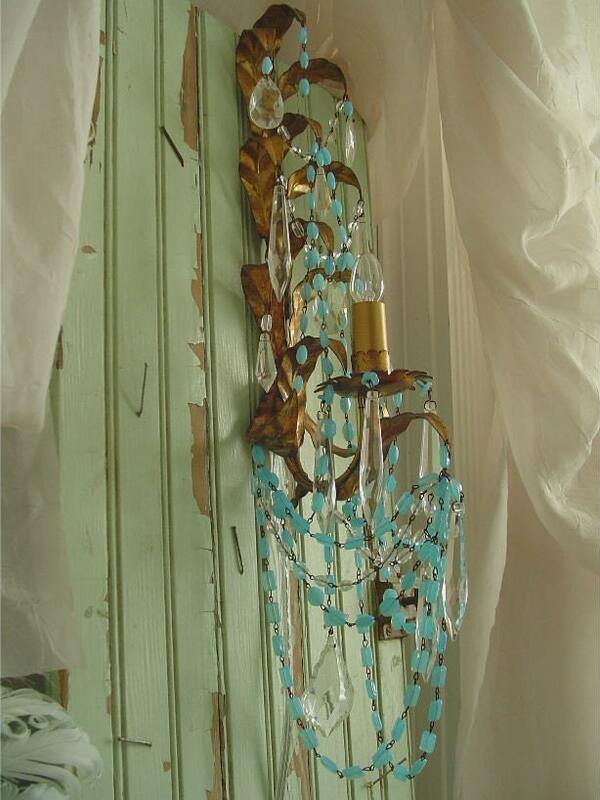 This pretty vintage Italian sconce has interestingly shaped opaline beaded garland~price $450. 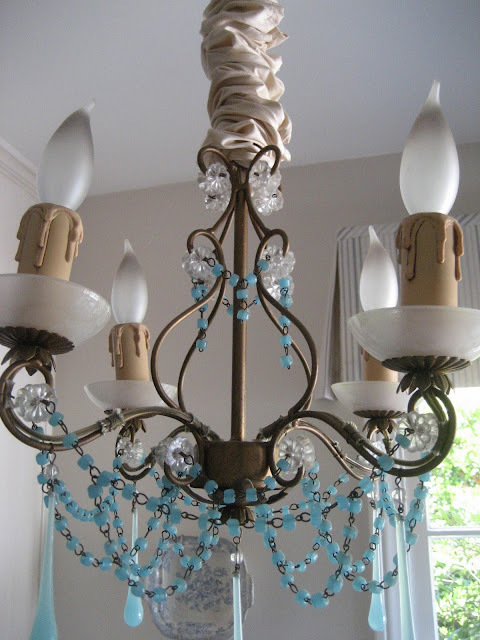 This is one of a pair that I purchased with my Cinderella style chandelier. It was bought as a set by this woman in Austria and they landed in Florida decades later. 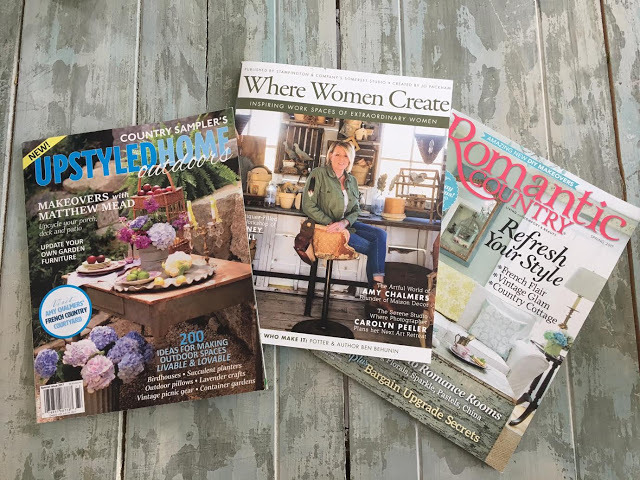 I try to imagine what kind of a woman was walking around Europe going to look for a pretty chandelier and sconce set to buy for her darling daughter. Maybe she bought them for her as a wedding gift~I will try to learn more of the story and let you know. The beautiful milky blue color of the drops is more translucent than the beads. Look at the beadwork on this~it is all strung together in a net to cover the bottom area and then the beads swoop up to the top and across the front with more drops! Lots of goblets and champagne glasses, bowls, a vase..
And one pair of love birds! to think it all started in France during Napoleon's rein~centuries ago! you know I would love to see it! The Glam Wall Accent Reveal! 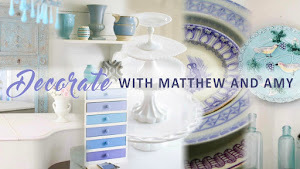 Shabby Chic Soho Giveaway Winner!